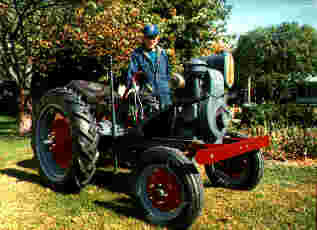 Jim obtained this tractor from his brother-in-law in Michigan in 1979. For several years it stayed behind the shed, and was only used for plowing the garden. In 1992, Jim put it on his back patio, enclosed the patio with plastic so that he could work on the tractor all winter. He disassembled everything except the engine. He cleaned, inspected, and painted everything else to get the tractor to it's present condition. Jim says the tractor was originally made in Longmont, Colorado. He takes the tractor to The Matthews Covered Bridge Festival in Matthews, Indiana every year as well as to the shows in Rushville, IN and Portland, IN.